I'll be in Los Angeles for a few days next week. While I'm there I will hold a "meetup" or a "tweetup" or ... let's just call it a casual get-together. Please RSVP on this Facebook event page. Makai is at the corner of Ocean and Broadway -- just one block from the Santa Monica Pier. You'll find no-cost three-hour parking at the Promenade garage off of Broadway and 2nd St.
No workshop, no teaching. Just a casual get-together with cool, creative friends in the area. It's Happy Hour at Makai from 4 to 6 that day. I'd love to meet you and hang out if you're in the area! P.S. 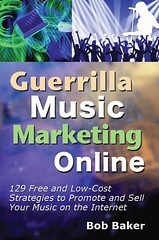 Want a subscription to my Guerrilla Music Marketing Confidential newsletter and access to a monthly Music Marketing Mastermind call? Click here for details.